I recently wrote about the journey of moving from a traditional content management system to a headless / decoupled one and learning all the issues that need to be considered. For the process of selecting a headless cms software or service we needed a way to help compare them more easily as we tested each of the services. 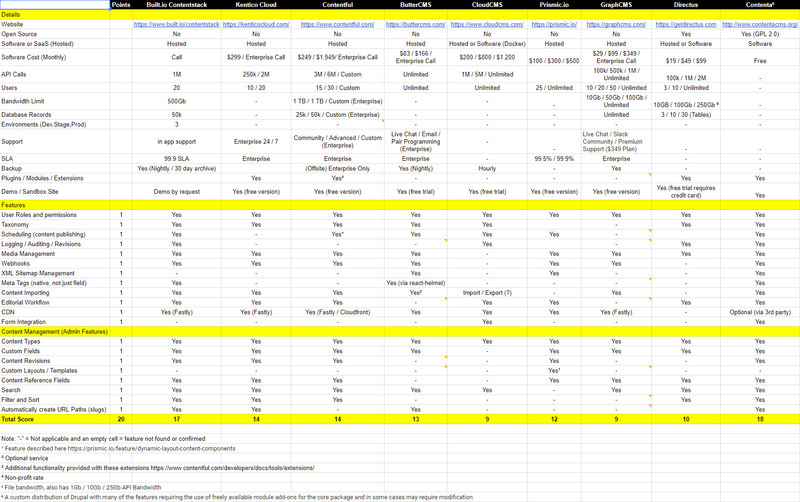 This resulted in the creation of my Headless CMS Comparison Matrix which includes the software and services on our short-list to research for our selection process. I’ve added a points column for some of the features. One way to modify this to better suit your needs would be to change the values on a scale (like 1-5) per feature as a weighting mechanism. Something to keep in mind is that scores alone won’t tell the whole story. I’ll use the same disclaimer I provided from my Project Management Services Comparison Matrix. There are many other factors to consider like design, user experience, and I’m sure many other issues that can’t be captured from just a feature comparison which need to be considered by test driving these yourself. This matrix should provide you with a baseline you can copy and customize to help you do your own comparison. You can view the image below or view the shared Google Sheet. Please let me know if you find any issues or have feedback by commenting on the sheet or here as well.